We awoke to my alarm clock for the first time on the trip. It had been set for 6:45 every morning, but this was the first time we hadn�t been up and dressed before it went off. Not that we are such early risers, but we still weren�t totally adjusted to NZ time; at home it was lunchtime, but yesterday. We were on the road by 7:30 � we didn�t want to waste any of our vacation time sleeping in. 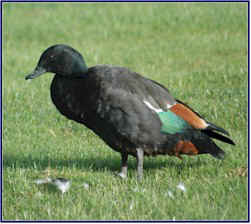 We stopped in Wanaka to photograph a pair of Paradise Shelducks in the park. They tend to be very shy, and I had been trying to get a close-up shot of some all week, but this pair appeared unafraid and I was able to easily get within camera range. We reached the end of the valley, and stopped at a scenic overlook where we could look down over Arrowtown. Ahead of us the countryside was once again fairly green, and quite lovely. We were dismayed to find that someone had thrown a bunch of beer bottles out on the side of the road; this is something you don�t see too often in NZ. Jineen picked them up and we took them to the nearest rubbish bin. There had been fewer dead possums on the road today (only 13 so far), but to Jineen�s dismay this seemed to be Suicide Hill for bunnies; we saw an abundant number that had been hit. It was hard to believe that anyone could negotiate this treacherous piece of highway fast enough to run over anything, but apparently they did; our roadkill count on this stretch also included a ferret, a hedgehog, and a dead fish! Go figure. 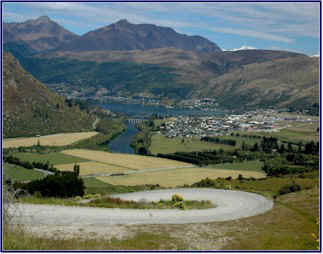 We passed Queenstown, often called �the adventure capital of the world�. We had visited it on our 2004 trip (and bungee jumped! ), so we didn�t stop. 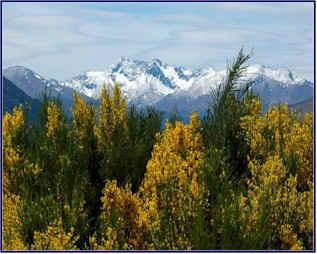 Just south of Queenstown, we passed a very steep rugged-looking mountain range on our left called �The Remarkables.� We decided to drive up the unsealed road to the Remarkables Ski Field at the top. We headed up the road, which wound back and forth across the side of the mountain. The views were �remarkable.� Ha, ha, pardon the pun. But at least I have a new superlative to describe the scenery. We could look down over the whole town of Queenstown . We stopped to watch a hang glider soaring; he had launched from the summit. 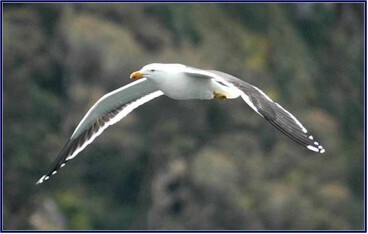 He road the air current down in spirals, and finally landed in the river valley below us. We went up and up. The gravel road was narrow, steep, and very, very twisty. The higher we climbed the more rutted and rough it became. The turns on the switchbacks were so tight and steep that we couldn�t see the road above us; we felt like the car was just pointing into space - all we could see was sky. I hugged the uphill side of the turns, regardless of which side of the road I was supposed to be on (Jineen coined a new term; road hugging). The sheer drop-off beside us was hundreds of feet, and more like thousands as we got nearer the top. You guessed it, no guardrails. By the time we got near the summit we were literally clinging to the side of the mountain, barely crawling along. Snails move faster. I am sure the scenery was fabulous, but I didn�t enjoy it. In fact, I�m not sure I even saw it! I felt kind of sick, and Jineen looked a bit green too. I knew that if we ever made it to the top alive, my white-knuckled fingers would have to be pried off of the steering wheel. �How risky could it be?� indeed! Eventually, against all odds, we came to the top. There was a good sized parking lot and a lodge, but we were surprised to see that the ski area itself was really small, with just two short lifts, and very short ski runs. It was amazing to us that people would actually negotiate that outrageous road to go up there to ski such a small area. We considered ourselves lucky to be alive after driving it in the summer; we could only imagine what it would be like when covered in snow! We met a lone hiker in the parking lot, with a pack and ice crampons. He told us that there was a track up from the lodge that went along the ridgeline, and not being eager to get back in the car immediately, we decided to go for a walk. We went past the ski lodge and followed a tiny path that wound up among the rocks and across the tundra. 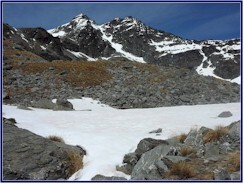 We climbed up the rocky trail, crossing snowfields as we got higher. The sun was shining brightly; it had been a little hazy down in the valley, but here on the mountaintop the crystal clear sky was an amazing deep shade of blue. 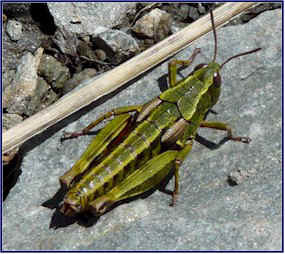 We were at a high elevation (2324 meters), and about the only living things we saw were mosses, lichens, a few tussocks of stiff tough grass, and grasshoppers. We picked up some purple stones to add to our collection. 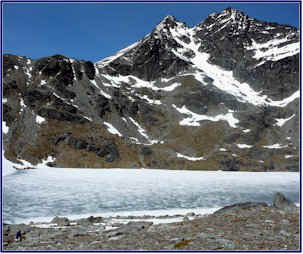 Presently we reached Lake Alta , a small ice-covered lake nestled in a bowl among the peaks. We came to an icy stream and drank from it before crossing; this may have been the purest water I have ever tasted. We saw a group of climbers in the distance, working their way up a steep channel of ice and snow. Practicing for Everest, no doubt! We continued up towards the ridgeline. 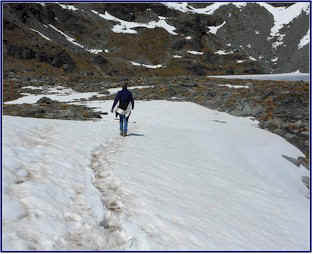 We clambered over the rocks and across snowfields, and the path got smaller and harder to follow as we climbed higher. We tried to step only on the rocks, to avoid damaging the moss underfoot. We sat on a high rock outcropping and looked down on the frozen lake. The rest of the world seemed remote, distant. The air was cold, but the sun was warm on our faces. It was very peaceful. Eventually we returned to the parking lot, where we had to face the prospect of the drive back down. I offered to let Jineen drive, but she declined. We headed down that crazy treacherous road, hoping the brake pads were new. It was slightly less terrifying on the way down; but I kept the car in first gear the whole way. We stopped for a few �photo moments� at a spot where we could look over Queenstown and Lake Wakatipu . A lamb was sitting on the brink of the cliff, panting in the warm sunshine. It was 13 kilometers (about 8 miles) from top to bottom, and it took us thirty minutes to drive it. 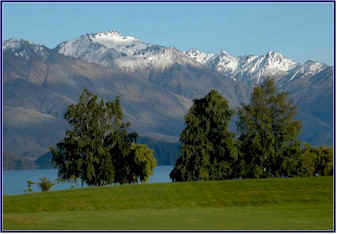 We continued south along Lake Wakatipu , with the mountains on either side of us. We passed the Kingston Flyer, an old style train converted to use for scenic rides, going from Kingston to Fairlight. We passed through green farm country, thick with cattle and sheep. We went by dozens of huge stations, with large mobs of sheep, the most we had seen on the trip so far. 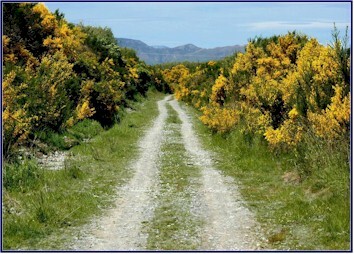 There were great areas of flowering broom and lupins, lining the road, lining the river beds, and at times lining the lower sides of the mountains with yellow. We stopped by a bridge over the Matauna River ; the whole riverbed was bordered with the brilliant flowers. 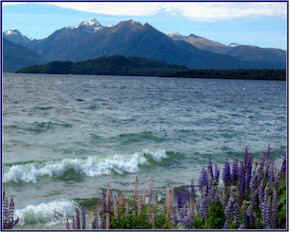 We arrived at Lake Manapouri in the late afternoon. Looking for lodging, we found a room right away, with a lovely view overlooking the lake. It was very quiet, and the town seemed to be empty. Once again, we were amazed at how uncrowded everything was; just before Christmas was definitely a perfect time to visit NZ. 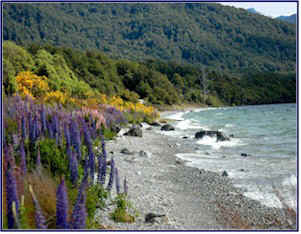 We walked along Frasier Beach , on the shore of Lake Manapouri. Lupins and broom bloomed all along the water. The wind was strong enough to cause a bit of surf on the lake, with small breakers rolling on to the beach. We collected stones, washed smooth by the water; I found several beautiful pale green ones that I carried in my pocket for the rest of the trip. Jineen found a sinewy piece of driftwood, about three feet long, iron hard, and twisted into a serpent-like shape. 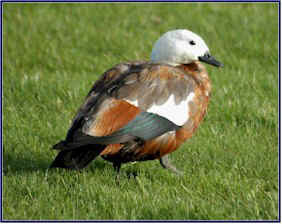 It appeared to have a face, and indeed Jineen also attributed it with a personality. She named it Manny (short for Manapouri), and neither of us being one to pass up an opportunity for a spot of anthropomorphizing, we soon realized that Manny had his heart set on traveling with us. We walked along the Old Coach Road , a path that went along the lakefront and then turned up along the Waiau River . It was a pleasant trail among the trees beside the waterfront. 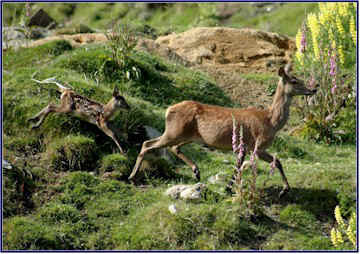 We passed a paddock of red deer , where several of the does had young fawns. We saw many birds in the woods and thickets. We disturbed a pair of fantails, and watched their ridiculous antics as they tried to lure us away; they must have had a nest nearby. We saw about half a dozen plovers chasing a hawk across the sky. We drove up a gravel road through the forest and found a lovely spot for happy hour, right by the edge of the lake, with amazing views of the mountains across the water. It was very beautiful and very private. We opened the Esk Valley Hawke�s Bay chardonnay; it was excellent, we gave it three and a half stars. Again we woke up to sunshine and good weather. We went down to the tiny town of Lake Manapouri and had an excellent breakfast at Caf� 23, an old wooden church converted into a small caf�. The seats were old original wooden pews, and the arched windows reminded you of the former role of the building. The owner was a friendly woman who made delicious sandwiches, pastries and pies. She chatted with us while we ate breakfast and asked us where we were from. Jineen and I looked at each other and giggled; � Canada � and � Toronto � immediately came to our minds. But despite our planned deception, neither of us could quite bring ourselves to lie about our origins. � Virginia ,� we admitted. 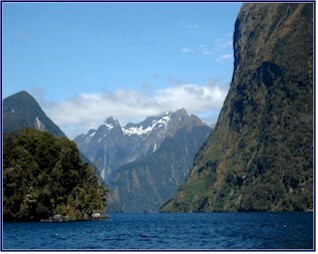 We took the �Fiordland Explorers� Doubtful Sound cruise. We had wanted to get a chance to explore the sounds of the south-western part of NZ, known as �Fiordland,� but had been reluctant to sign up for a cruise for fear of it being crowded and overly �touristy.� We were delighted to find this company that operated tours with smaller groups. Our trip started with a 45 minute boat ride across Lake Manapouri . Mike, our boat driver and tour guide (who incidentally looked quite a bit like Lance Armstrong), gave us interesting and funny commentary along the way. The boat was enclosed and warm inside but we wanted to be outside and feel the fresh air, so we went out on the back platform. Well, the air was fresh, all right. In fact, it was downright freezing! The wind was very strong as we flew across the lake, and we hunkered down behind the cabin for shelter. But the scenery was beautiful! Mike then drove us the 20 kilometers over Wilmot Pass , on a small winding unsealed road. 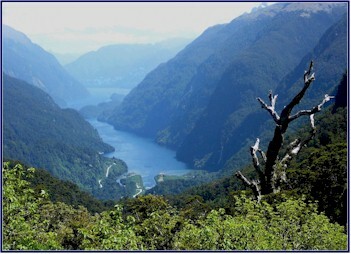 It wound up over the mountains, past waterfalls, and eventually down to Doubtful Sound. Mike told us that Wilmot Pass was discovered in the 1880s by accident, when a man disappeared in the area and his friends went out searching for him. They never found the man, but they did map the route for the pass. 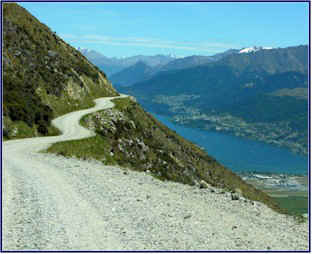 When the road was built, it ended up being the most expensive (per square foot) ever built in NZ. 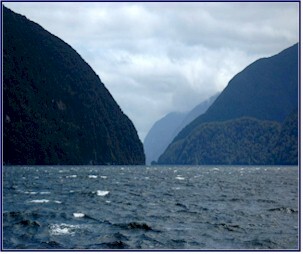 It goes only from Lake Manapouri to Doubtful Sound, not accessed by any other roads, and can only be reached by boat. We waited beside the water and fought off sandflies while Mike got the second boat, which took us through the sound. The scenery was unique and beautiful. The mountains were very steep and sheer sided, with their vertical faces continuing down into the water, so the boat was able to approach very close to the walls. Tannin from the forest, leached from the trees, runs down the streams and into the water of the sound, blocking out the sun and making the water appear black. It was quite nice and sunny, but Mike told us that the weather near the pass often has nothing to do with the weather further out on the sound. We learned that the West Arm of Lake Manapouri gets about three meters of rain annually, but parts of Doubtful Sound get 7 to 9 meters. That�s up to 30 feet of rain! Sure enough, when we got further out in the sound it was cloudy and spitting with rain. Jineen and I rode out on the front of the boat, and it was freezing. The wind was whipping like crazy; Mike explained that it usually picked up like that on sunny days. It was great to sit on the front of the boat as it raced across the water with the wind strong in our faces - but we had to go inside to warm up now and then. We traveled a long distance up the sound, exploring some of the smaller channels that branched off of the main waterway. We looked for penguins on the islands, but they had all left for the season. Seagulls flew close by us. On the open water the wind continued to blow really strongly, but in the more sheltered coves it was quiet and serene, and the obsidian water reflected every surface. Mike brought the boat right up close to several small high waterfalls. We gazed straight up as the water cascaded down the cliff. It looked almost like snow as it fell toward us, but it disappeared into mist as the wind caught the droplets and dispersed them. At one larger falls, the boat was so close to the cliff face that we could hold out a cup and fill it with water. When we returned to our launching point near Wilmot Pass , we left the clouds behind us and were once again in sunshine. 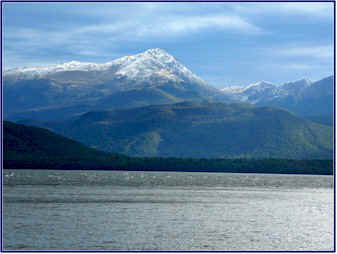 We got back on the bus and headed for Lake Manapouri . As we started up the steep road, Mike pointed out a small area beside the river, just a couple of acres, and told us how the DOC had sent a trapper in to reduce the possum population. In just that one small area, the trapper had caught 350 possums on the first night, and over 800 in the first week! This really shows how rampant their population has become. Returning to Lake Manapouri we boarded the original boat, again sitting out on the platform at the rear as we headed back across the lake. But Mike drove much faster on the way home, and the spray started whipping up; soon we were soaking wet and scrambling to get inside the cabin. Returning to town, we stopped back at the Caf� 23 and bought sandwiches and supplies for later. 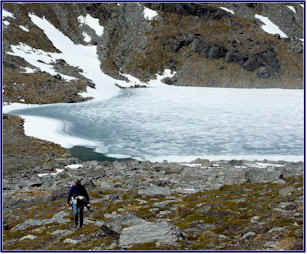 We headed north, up past Te Anau, where we walked the track to Lake Mistletoe . It was an easy path through the beech trees, lined with the ubiquitous broom bushes. The forest floor was covered in thick soft moss, springy underfoot like a mattress. When we looked up through the tall trees, the tops of them were swaying wildly in the strong wind. Ducks and geese swam on the blue lake, and evergreen trees and mountains provided a spectacular backdrop. Following our usual custom of finding a beautiful and secluded spot, we had happy hour and dinner by the shore of Lake Te Anau . The wind was still very strong, but we were cozy inside the car. The sandwiches from the Caf� 23 were excellent; wraps of venison, lamb, and smoked salmon. We finished off the last of the Hawke�s Bay chardonnay (excellent), and opened the Pegasus Bay Riesling � we had liked the label, but the wine was below average � we gave it only one star. We sat and watched the sunset. 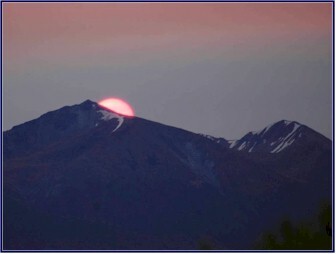 The large red disk of the sun hovered above the mountains, before sliding down behind a peak and disappearing with surprising speed. It had rained most of the night; we listened to it beating down on the roof, thinking that it didn�t bode well. 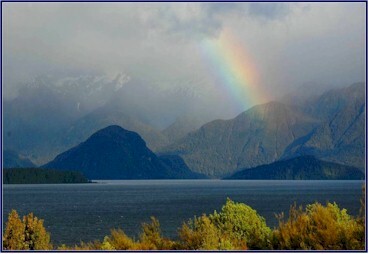 But in the morning when I looked out the front window, I was greeted with a beautiful rainbow arching down into Lake Manapouri . I hurriedly pulled on my jeans over my pajamas and went rushing out with my camera. We went to Caf� 23 again, where we breakfasted on venison sandwiches. We visited the petrol station, and then set off south; having spent most of the previous day on the boat, we were looking for a good hike. We followed the Southern Scenic Highway, one of the least traveled routes in NZ. About the only other vehicle we saw was a psychedelically painted hippie-type mini-van. 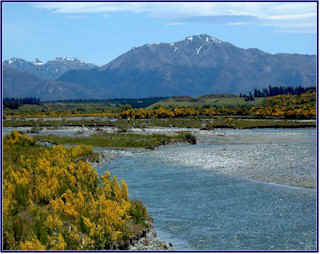 The scenery was beautiful, with broom-lined rivers flowing down from the mountains. 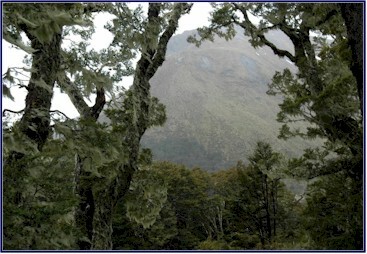 We turned up the Borland Road , a small lane that took us back into the Fiordland Park . Before long it turned to gravel and passed through a sheep gate; a bearded man held it open for us. There was a notice posted that said, �Road Open,� we figured that was a good sign. The unsealed one-lane road was narrow and winding. It roughly followed the huge power lines that came from the power station on the West Arm of Lake Manapouri. It wound along the sides of cliffs, often with sheer drop-offs to the river far below. The road was steep and much eroded, and in many areas flooding had washed parts of it away. We came to what we decided was a �NZ guard rail�; two sticks set upright in the mud where the edge of the road had crumbled away above a huge drop-off, with a strand of blue tape tied between them. We noticed a lot of rock slides above us, and we wondered how often they blocked the road. Then we rounded a corner and found the answer to that question. On the right the road was eroded, crumbling away at the edge to a sheer drop-off of hundreds of feet, and on the left it was blocked by a pile of rocks that had fallen from the cliff. We were barely able to squeeze through, holding our breaths as the left wheels climbed the rock pile and the car tipped alarmingly towards the abyss. And we weren�t even to the part yet that was marked on the map as 4WD only. We finally reached the viewpoint at Borland Saddle, where we had planned to hike the Mt. Burns track, but when we got there it was very cold and windy, and starting to rain. We were deep into Fiordland, where it seems to rain most of the time. The forest up on this high mountain pass was amazing; the trees were draped in long flowing strands of moss, and it looked like a fairyland. But the clouds obscured the views and the rain was pelting down harder, so we decided to forego the hike in such miserable conditions. We set off back down the road to see if the weather was better further on; sure enough once we left the Fiordland Park and returned to the Southern Scenic Highway it was a lovely day with sunshine and just occasional showers. Driving south, we went through rolling farmland. There were hardly any cars on the road, and the scenery was beautiful. The landscape seemed to consist mostly of sheep stations; as far as we could see the hillsides were dotted with sheep. There were cattle and deer in the fields also, but no horses. We saw two lambs asleep on top of a hayroll. Coming to the town of Clifden (which according to our guide book had several interesting attractions), we planned to go to the Department of Conservation Information Center and get the details on things to see and do in the area. The DOC has welcome centers or information centers in each town, but usually we seemed to either get on the road before they were open or roll into town long after they were closed, so we rarely got to take advantage of this excellent resource. But for once we would be arriving in town mid-day so we could visit the info center. The only problem was we couldn�t find the Clifden DOC info center. In fact, we couldn�t find Clifden. Because it wasn�t there! It showed up on our map as a town, but all there was to it was a couple of houses and a sign. This could be a problem, as Clifden was where we had planned to find lodging that night . . .
We made a quick stop at the Clifden Suspension Bridge , built in 1902. I thought the most interesting thing about it was the plaque beside the bridge, telling about a young man named Joseph Carthwaite. He drowned while trying to deliver the mail about the time the bridge was built, and his body was found months later in a place now known as Mailboy�s Cave. Some say his horse was found drowned also, others say the horse finished the mail run alone.